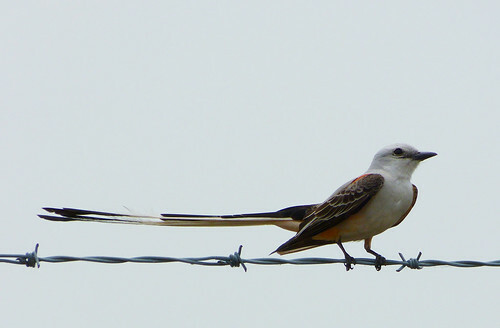 We were in Little Rock when we got the email that a Scissor-tailed flycatcher had been seen in New Jersey in Franklin Township. Mike was debating whether to skip work on Monday to see this rare bird. 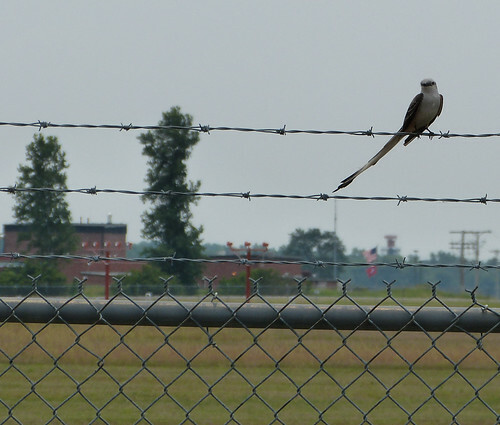 Our GPS took us on a weird route to the Little Rock airport, taking us past the fenced in grasslands around the runway. As Chris was driving, Mike yelled for her to stop the car. 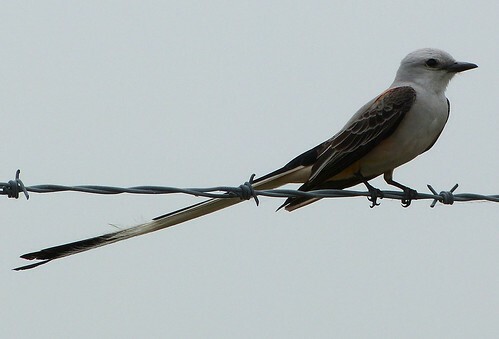 There was a scissor-tailed flycatcher on the fence. Chris turned around and Mike got the camera out of the trunk, but the bird flew away. 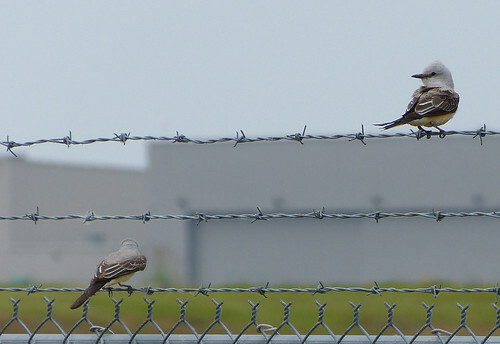 We proceeded slowly to the airport and saw one more male flycatcher on the fence further up and then two females. I guess Monday is a regular work day, although the bobolinks in Union sound tempting. I truly admire your photos. It's a visual treat to visit your site. What exactly is the 'birding' camera. I am astounded at the quality of the photos. Keep up the great work. Thanks for the kind words. The camera used for these flycatcher photos is my “people” camera, a Panasonic DMC-FZ150K. It does have a 24x Optical Zoom which makes it pretty good for birds too. I got it for a trip we took to Africa last December when I discovered we might be too close to the Africa mammals to use my “bird” camera. Some photos from that trip are on another blog at Londolozi. My birding lens is a Sony 500mm f/8 Reflex Telephoto Lens500. The 500mm makes it one of the more powerful telephoto lenses. The “reflex” means that it uses mirrors vs. glass lenses for magnification, like a reflector telescope. The primary advantages of the mirrored lens are the compact size and lower cost when compared to other lenses. This lens also has autofocus and image stabilization on the Sony DSLRs. There are several disadvantages to this lens. It is a prime lens so you get one fixed magnification and can’t zoom in and out. It also has a fixed aperature of f/8 while f/2 would allow faster shutter speeds and perform better in low light situations such as mornings in New Jersey. The mirror lenses produces circular bokeh-- the out-of-focus elements look like doughnuts due to the mirror in the front of the lens that blocks the center of the lens. My feeling is that the advantages outweigh the disadvantages of other telephoto lens. I can carry it on long walks and with image stabilization I don’t need a tripod. Autofocus is quicker than manual focus for me which is useful for birds that don’t stay still for too long. Digital cameras today produce good quality photos with little noise at 1600 ISO so I can take reasonable photos in low light situations. The camera I currently use with this lens is aSony DSLRA580 DSLR It is substantially better than my prior camera, a SONY A350 in low light. Together with the Sony lens, it is almost a point-and-shoot camera. The only other hint I’ll give is that I take a lot of photos of the same bird and only show people 1 out of every 100 photos I take.